Sometimes you have a little job, but you just don’t want to do that job with a hand tool. Take this little canoe repair. A crossmember needed a single rivet to supplement the existing rivets, but I ran out of the proper size and needed to put the canoe into storage instead of leaving it in the way until I went to the store. Four rivets down, one to go. Darn the luck! 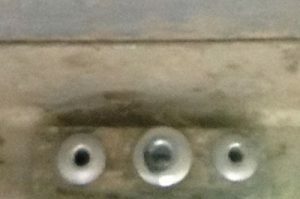 I ran out of rivets when I originally repaired this crossmember, turning the final, single rivet installation into a separate job. When I finally got the right fastener, I first reached for the manual rivet gun to pop it into place. Then, I remembered the pain in my arm, shoulder and neck from having hurt myself during a garage renovation project. That’s when I decided to put in a little effort now in order to achieve a long-term savings. As you can read in my Highland Woodworking Blog post, after the injury I purchased an inexpensive, air-powered rivet tool. While it seems like overkill to pull out an air tool for one rivet, I’ve discovered that I can still aggravate that old injury with the wrong squeeze of my hand. The canoe repair was uneventful. One of the ways I made it easy was by taking my air with me, instead of running a hose all the way to the canoe. 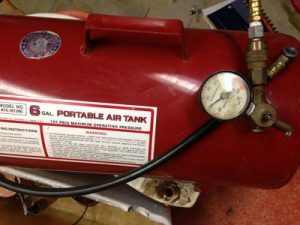 Enter: the portable air tank. If your job isn’t too terribly big, you may be able to accomplish all you need to do with one good filling. First, pump it as full as the attached gauge shows is safe. 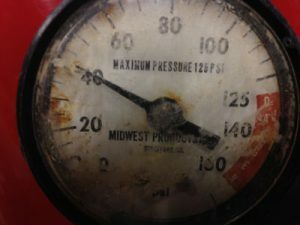 My compressor goes to 125 psi. Fill the tank all the way, but don’t exceed the safe pressure limit. Let your imagination fly! I finished my little riveting job in far less time than it took to set up, but, gained the two weeks that I would have been in pain. I’ve used the tank for impact wrenches and blowing small jobs that didn’t lend themselves to a brush or broom. Of course, the original intention of an air tank purchase was to pump up flat tires, but it’s far more versatile than that! Intro – Basic Woodworking Class at Center for Furniture Craftmanship Poll: How Do You Feel When Non-Woodworkers Call You a Carpenter?